In January–December 2017, an extensive excavation were conducted at the site of ‘En Esur (‘Ein Asawir; License No. A-7888; map ref. 20199/70940; Fig. 1) prior to the construction of an interchange. The excavation, undertaken on behalf of the Israel Antiquities Authority and financed by Netivei Israel — the National Transportation Infrastructure Company, was directed by I. Elad and Y. Paz, with the assistance of A. Gorzalczany, S. Emanuelov, S. Davidov, L. Brilovsky, A. Massarwa, O. Segal, S. Elbaz, D. Shalem, G. Sovolev and E. Oren (area supervision), K. Sa’id and M. Massarwa (IAA Haifa District), Y. Amrani and E. Bachar (administration), D. Pinhasov, A. Barkai, A. Rabin, N. Shaul, A. Ofir, A. Rosenthal, A. Akiva, A. Kostrov, E. Kashi and A. Kap Kadosh (education and guidance), M. Kahan and R. Mishayev (surveying and drafting), A. Peretz (field photography), Y. Marmelstein and Griffin Higher Photography (drone photography), Trilog Company (magnometric surveying), L. Brailovsky (flint tools), L. Perry (faunal remains), Y. Nagar (physical anthropology), E. Yannai (pottery) and P. Gendelman (scientific guidance). A. Massarwa, E. Oren and S. Davidov supervised the excavation of trial trenches prior to the excavation. ‘En Esur is situated at the outlet of Nahal ‘Iron (Wadi ‘Ara) in the northern Sharon plain, near Tel Esur (Asawir; c. 28 dunams) and approximately 1 km east of Moshav ‘En ‘Iron. Two springs are located within the site: ‘En Esur (‘En Arubot), to the east of the tell, and an unnamed spring southwest of the tell. Another small tell lies nearby, to the southeast of Tel Esur. 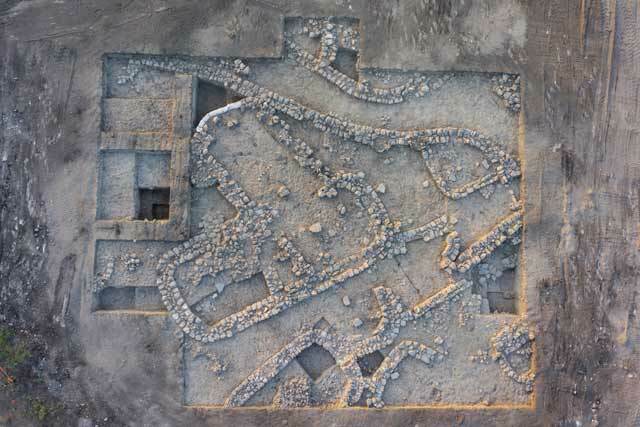 Excavations conducted at both tells in 2001–2003 (Zertal 2003) and 2010–2012 (Bar 2016) revealed occupation layers from the Early Bronze Age I, the Middle Bronze Age II, the Late Bronze Age, the Iron Age II, as well as the Persian, Hellenistic and Roman periods. ‘En Esur is a large proto-historic site extending over a level plain (c. 650 dunams) lying below and mainly to the south of Tel Esur. In the center of the site, approximately 220 m south of Tel Esur, is a small hillock. 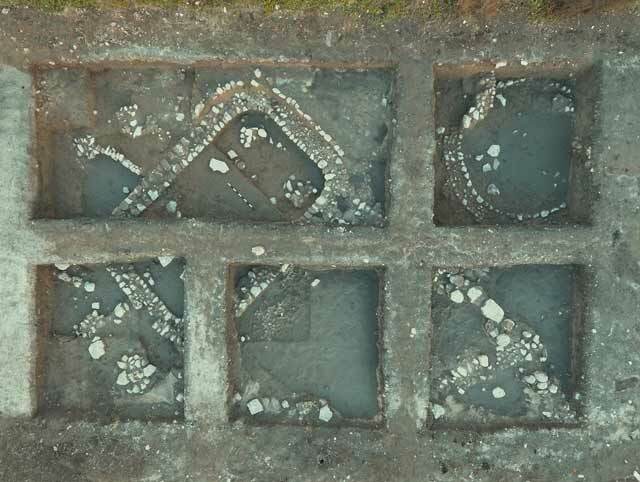 Previous excavations at the site unearthed the remains of a settlement from the Pottery Neolithic, Early Chalcolithic and Late Chalcolithic periods, as well as from the Early Bronze Age I and the Intermediate Bronze Age (Yannai 2006; 2016b; 2016c). Dozens of rock-hewn burial caves belonging to settlements at the site have been found in the hills to the east and south of ‘En Esur (Yannai 2016a). Sixteen areas (K1–K4, L1–L3, M1–M5, O1, O2, P1, P2; Fig. 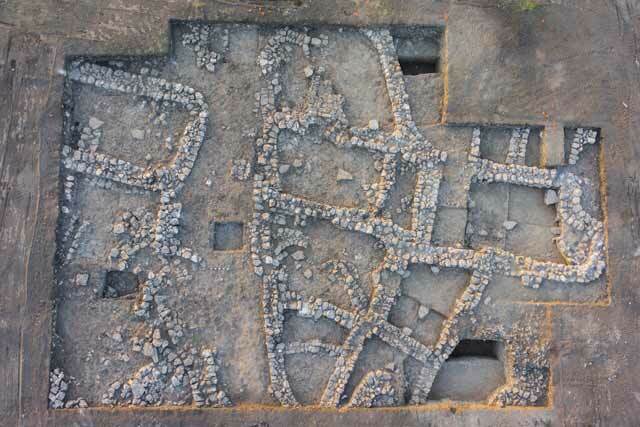 2) were opened in the current excavation, in which 200 squares were opened. Remains from the following periods were unearthed: Pottery Neolithic, Early and Late Chalcolithic, EB IA, EB IB, Intermediate Bronze, Late Roman and Byzantine. The Pottery Neolithic Period. A few potsherds and flint artifacts attest to the site’s occupation during this period. The Early Chalcolithic Period. Fragments of pottery vessels from this period were recovered from many of the excavation areas at the site. Settlement remains belonging to the Early Chalcolithic period were found in four excavation areas. These included the walls of buildings (Areas L1 and O2), habitation levels and stone circles (Area M2) and a jar-burial of a child (Area M5). The Late Chalcolithic Period. Area O2 yielded two strata from this period. The earlier stratum yielded part of a building and habitation levels that postdate the Wadi Rabah culture, but probably predating the Ghassulian culture. The later stratum yielded a corner of a rectangular building and floors made of ceramic body sherds and crushed chalk, which belong to the Ghassulian culture. Early Bronze Age IA. Remains of this period were exposed only in Area O2, at the heart of the site. At least four settlement strata were uncovered, yielding about ten densely built round or elliptical structures (wall width 0.4–0.6 m; Fig. 3). Installations, a drainage channel and work surfaces were found in several of the buildings. An installation constructed of tabun material was unearthed in one building. A rectangular building (Fig. 4) was discovered in the later stratum. Its plan and ceramic finds recovered from its floor suggest that it dates from the transition phase between the EB IA and the EB IB. Early Bronze Age IB. 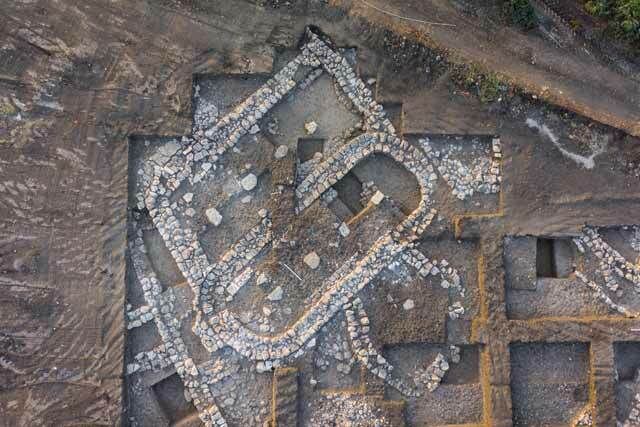 Dozens of buildings ascribed to two main strata were discovered in all the excavation areas at the site (Figs. 5–7). Two phases of construction were discerned in the later stratum in many of the excavation areas. In the two strata belonging to this period, several types of basic architectural units existed alongside each other: capsule-like structures, rectangular structures with rounded corners and rectangular structures with square corners. Many of the buildings were joined together in insula-like structures and quarters, which were separated by streets and alleys; others were located within a walled complex; and several were free-standing buildings. Only the stone-built foundations of the walls were preserved; no traces remain from the upper courses, which were probably made built mud-bricks. Most of the buildings were constructed in a north–south or east–west alignment. The entrances were generally set in one of the longer walls. 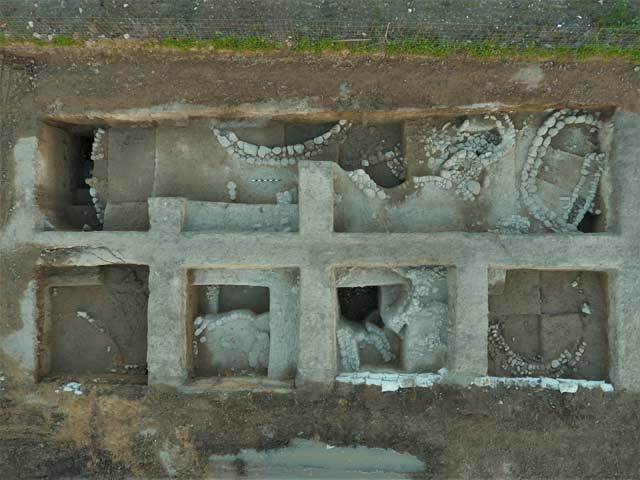 Large stone bases, on which wooden pillars were probably placed to support the roof, were discovered along the central axis of the buildings. Silos—of which one or two circles of stones were preserved—were found near and sometimes even attached to some of the buildings. 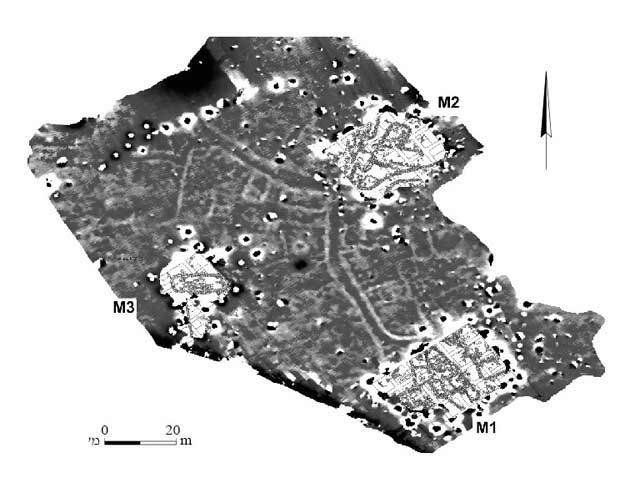 A magnetometry survey conducted in the unexcavated area between Areas M1 and M3 shows that the excavated street segments are part of an intricate network of streets connecting the various quarters and complexes of the settlement (Fig. 8). The survey also revealed that the site was densely built, with hardly any open spaces. The excavation yielded numerous potsherds of locally made pottery vessels, as well as a few fragments of Egyptian pottery, including a bottle and a cylindrical vessel. Intermediate Bronze Age. Pottery sherds were discovered in several of the excavation areas, but no building remains were uncovered. Late Roman and Byzantine Periods. Potsherds from these periods were recovered from the surface in many of the areas; most were small and worn. A refuse pit (2.2 × 2.3 m, depth 0.4 m) from the Late Roman period (third–fourth centuries CE) was exposed in Area K3. A well-plastered water channel found in Area P1, which may have served in diverting water from nearby Nahal ‘Iron, probably dates from the Late Roman and Byzantine periods. The preliminary results from the trial excavation at the site of ‘En Esur indicate that it was first settled in the Pottery Neolithic period. During the Early Chalcolithic period, the site covered a large area, but at this early stage of the excavations it is not yet possible to determine the precise extent of the settlement. During the Late Chalcolithic period, the settlement clustered around the center of the site, near the springs. This area remained the nucleus of the settlement in the Early Bronze Age. In the Early Bronze Age IA, the site covered a relatively limited area, of only a few dozen dunams. Early in the Early Bronze Age IB, the settlement expanded to cover several hundred dunams, and toward the end of the period it reached its maximum size (c. 650 dunams). During this period, the settlement was densely built and exhibited the characteristics of a planned and organized proto-urban settlement. The site was abandoned late in Early Bronze Age IB, like other sites of this period, such as Tel Bet She’an and Tel Megiddo. Bar S. 2016. Tel Esur 2010–2012. HA-ESI 128. Yannai E. 2006. 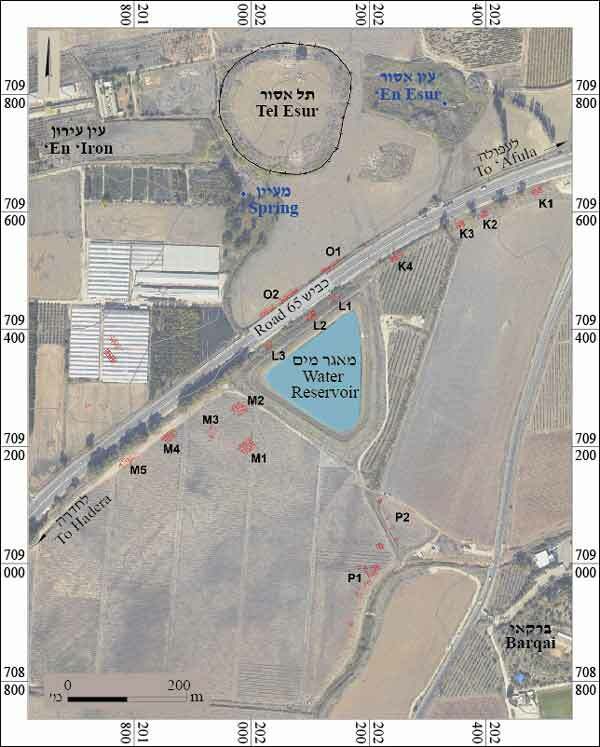 ‘En Esur (‘Ein Asawir) I: Excavations at a Protohistoric Site in the Coastal Plain of Israel (IAA Reports 31). Jerusalem. Yannai E. 2016a. ‘En Esur (‘Ein Asawir) II: Excavations at the Cemeteries. Jerusalem. Yannai E. 2016b. Remains of the Wadi Rabah culture and Early Bronze Age IA–B in Area I at ‘En Esur (‘Ein Asawir). ‘Atiqot 85:*1–*21. Yannai E. 2016c. Remains of the Wadi Rabah culture, Early Bronze Age IB and the Intermediate Bronze Age in Area J at ‘En Esur (‘Ein Assawir). ‘Atiqot 85:*23–*43. 2. 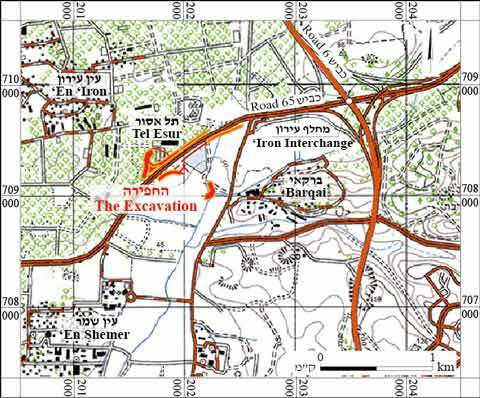 Map of excavation areas. 3. Densely built EB IA structures, looking northwest. 4. Building from the transition phase between EB IA and EB IB, looking northwest. 5. Area M1, EB IB street and buildings, looking northwest. 6. Area M2, EB IB buildings and streets, looking southeast. 7. Area M4, EB IB building, looking southeast. 8. Results of the magnetometry survey conducted between Areas M1, M2 and M3.